Self catering holiday chalet in Niton, IW, with balcony overlooking Isle of Wight countryside and the sea through the trees. 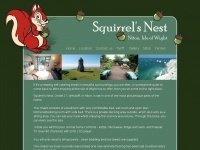 The web server used by Chilloutisleofwight.co.uk is run by Fasthosts Internet Limited - UK's largest web host and is located in Gloucester, Great Britain. On this web server 42 other websites are hosted. The language of those websites is mostly english. A Nginx server hosts the websites of Chilloutisleofwight.co.uk. XHTML 1.0 Transitional is used as markup language on the webpages. The website does not specify details about the inclusion of its content in search engines. For this reason the content will be included by search engines.